Karamba Casino Review 2019 - Want To Play At Here? DON'T DO IT! Karamba Casino has been providing real money online gaming entertainment since back in 2005. This mobile-friendly site is particularly popular with UK players, having made a great impact on that market. Karamba Casino sells itself as a fun gaming site and is all about bright colors and entertaining games. 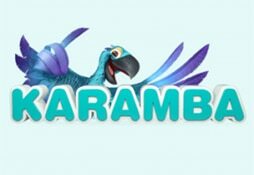 The site’s mascot is a cheeky blue parrot who urges you to ‘Go Karamba‘ and experience the fun of playing casino games. When it comes to gaming options, this site is reasonably well-stocked in that regard. There are over 200 games on site including slots, scratch-cards, and traditional casino table games. The mobile version of the site allows you to take this casino with you wherever you go, a very important factor these days when so many use smartphones to access online casinos. Karamba Casino is owned by ASG Technologies, and has been going strong for well over ten years now. The site puts an emphasis on video slots but is also careful to highlight its live dealer casino offerings. The casino is regulated and licensed by the Malta Gaming Authority, and in combination with its lengthy operating time, this is a guarantee of player security. Karamba uses games from a variety of different providers, which of course means that the player can enjoy a diverse selection of games. However, the quantity of games available is somewhat limited when compared to rival sites, with just over 200 to choose from. New sign-ups to Karamba Casino will be welcomed with a package which offers a 100% matching bonus as well as 100 free spins. On day one you get a bonus matching your deposit up to a maximum of £200 along with 20 free spins for the Game of Thrones slot. When you come back to play and deposit again on day 2 you will get 40 more spins, and the next day you get another 40 plus a ‘surprise bonus’ if you deposit another sum of no less than £20. The wagering requirement of x35 your bonus sum is very generous in today’s market, making this a very competitive welcome offer. Depositing and withdrawing funds is made easy by the fine selection of payment methods available here. For many, debit and credit cards are the handiest option and Karamba allows deposits by Visa, Mastercard, and Maestro. You can also choose the Entropay virtual credit card as well. Neteller and Skrill are electronic wallets which are widely used to fund gaming accounts and are a speedy and low-cost funding option. Then there is the bank transfer option, including Sofort, if you prefer to avail of that payment alternative. Finally, Paysafecard is a voucher system which can be used to make online purchases anonymously and is growing in popularity in the gaming world. We always like to see an online casino which offers games from a variety of different providers. Variety is the spice of life, they say, and this is certainly true when it comes to casino gaming. NetEnt, Microgaming, Amaya, NextGen and NeoGaming all provide games to the Karamba site, giving a nice balance of options to the player. The slots include favorites like Gonzo’s Quest, Immortal Romance, and Rainbow Riches along with many newer titles. There is a good selection of casino table games, including live dealer options for baccarat, blackjack, and roulette. Although Karamba cannot match the number of games offered in certain larger casinos, the quality and variety available is a definite plus. The Karamba parrot guides you to the live chat function available on every page of this site, where customer support is available from 6 am until midnight (UK time). While it is unfortunate that there is no 24-hour support, this reflects a UK focus which concentrates on the busiest times of day for that market. If live chat is unavailable, you can contact the site by email with any queries. There is also the option to telephone during working hours. The standard of customer support on offer is extremely high, and a comprehensive FAQ section will provide the answers to most queries without the necessity to get in contact with the site. Karamba Casino is not one of those stuffy online sites which tries to replicate the feel of a land-based casino. Instead, it is all about putting the fun into gaming, which is reflected in the colourful site design and charming mascot. The games selection is not enormous, but there is still enough on offer to keep casino fans happy. The emphasis is clearly on slot games, although the live dealer offerings are also prominently displayed on the site. The welcome bonus is generous, although perhaps the rewards for a second and third deposit on consecutive days are not overly generous. In summary, Karamba Casino has earned a respected place in the industry over the past decade and has been consistently entertaining players since 2005.